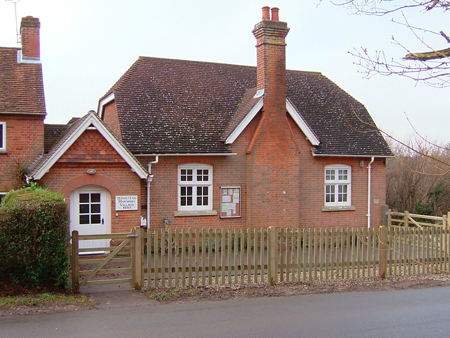 The village hall is in Park Lane: about 200 yards north of Ash Tree Corner, about 400 yards west of the Craven Arms, and about 300 yards east of the White Hart. Turn north at Ash Tree Corner. 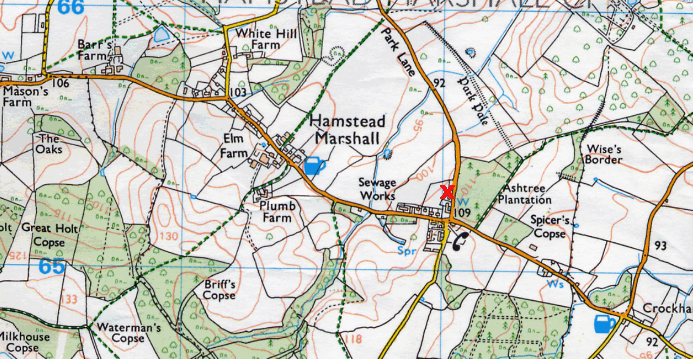 It is marked X on the map opposite. What sort of hall is it? The hall measures 17-feet by 30-feet, and can take up to 55 people. A high ceiling and a large north window give the main hall a light and airy feel. There is also an entrance lobby with coat hooks, a fully fitted kitchen, a rear lobby with storage, and toilets with nappy-changing facilities. Heating is by wall-mounted infra-red units. All areas have disabled access. Outside there is a car park and outdoor play area. See a plan of the village hall. See the What's On page for details. Who can hire the hall? 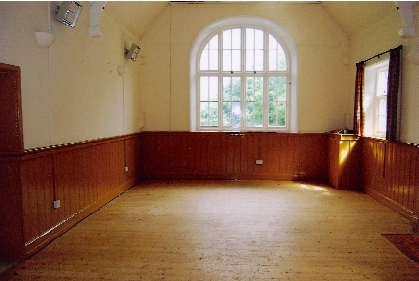 The hall is available for hire when not in use by regular hirers. The hall’s capacity (fire regulations and health and safety) is 55.
bookings for teenage parties cannot be accepted. Contact for hire is Sue Watts: email or 01488 658932, 07884 004418. Winter rate October to May is £8.00 per hour inclusive of utility charges. Summer rate June to September is £7.00 per hour inclusive of utility charges. No additional charges are made for use of the glasses, crockery or cutlery, but please report any breakages. Large teapots and hot water urn are available on request. For children under 5 small tables and chairs are available free of charge (seating for up to 20). The recreation field beside the hall is available to use during a hire. However, as it is a general village facility, usage by hall hirers is not guaranteed to be exclusive.